If you think you know the arts scene in Brattleboro but haven't been to Neumann Studios Stained Glass, you may be surprised to find out how much you have missed. On the Gallery Walk map, but a bit removed from Main Street's central zone, this marvel of a studio is located in an historic church in a sequestered neighborhood. The visit is well worth the walk (drive if time dictates), in order to experience the intricacies of craft and variety of classic techniques employed, and experimented with, by the mutually talented Rick Neumann and Liza King, artisan-owners. These days, it seems that much of what impresses the eye does so because it is new -- that is, some conceptual approach or stylistic invention we are unfamiliar with, which makes us think in a new manner, maybe in a way that seems appropriate for the contemporary mind or culture. This is always a thrill to find, but even more so if we can also see the history of a particular medium in the work. For that which looks to the future, while being cognizant of history, grounds this moment in time while aspiring to the timeless and the universal. Perhaps it is this historical perspective that clarifies the difference between descriptive words like "talented" and "masterly" when applied to something brought forth through the creative process. 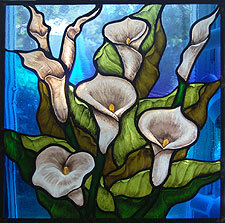 where calla lilies grow wild. 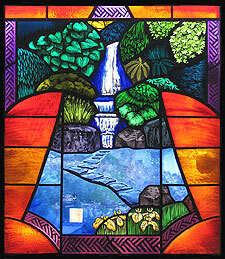 At Neumann Studios, one can see new ideas being explored using all the techniques developed by previous stained-glass masters, through the many centuries that people have delighted in colorful light captured by stained glass. That has happened, of course, since the building of houses of prayer. In fact, we can only wonder at the number of times someone has looked upward in ecstatic spirituality, only to have the light of the heavens defined by transparent colored glass, artistically and structurally designed and held together with lead. 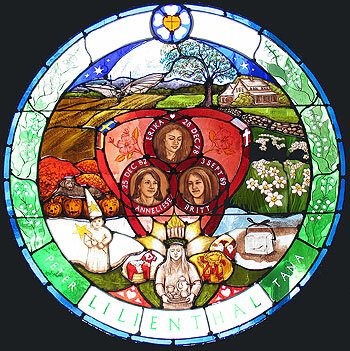 Over the generations, since, let's say, the Renaissance, stained glass has been used expressively, always growing from the development of material and technique. Colors of glass have been created all over the world, in laboratories ancient and modern. They can be rare or costly to obtain. Textures, inside the glass or on its surface, add to the visual experience, all this defining the quality of the light shining through. The surface can be altered in a number of ways: either to add color locally; to affect transparency or make it opaque; or as a field for letters, designs or rendition, that is, drawing. There are techniques, such as sandblasting, or adding actual glass pigment or glaze to the surface of the glass, which produce a multitude of effects. These techniques and others are combined creatively in marvelous fashions by this pair of artists, Neumann and King, in their studio. Here, a design is sandblasted in; there, a bit of brilliant pigment has been laid over a spot which was sandblasted on the opposite side. The plethora of potential visual experiences is impressive. One such technique, demonstrated by both artists, could be employed to simply darken the tone of the glass, or could be used in an etching-like manner to create decorative or descriptive pattern, or even be used as a highly sensitive drawing medium. 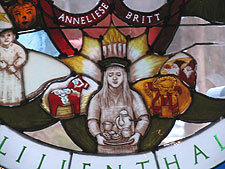 The technique, known as traditional glass painting, employs a material called glass stainer's paint (ground glass and pigment, which is then kiln-fired). At the studio an interesting array of tools is available for working this medium. And many examples of its use will show the visitor exactly what has been found possible in the little church halfway down the hill. But to diverge a moment, to something more familiar, and therefore, perhaps more impressive: Have you ever tried to cut glass? Was it a straight line? If you have, perhaps you were successful, perhaps not; but either way, all the better, because if you watch Rick cutting an easy "S" curve, then lightly tapping it free, you may experience a moment of awe. Now, before the stained-glass artist may think in terms of light and color, texture and description, there comes another extremely involved part of the work process. This is the overall design of a piece, the "mapping-out" of the shapes of cut glass, connected by the various thicknesses of "H-channel" lead stripping, which serve as the structure and as a major two-dimensional design element of each piece. This process should not be underestimated, as it requires not only aesthetic and compositional considerations, but also careful planning regarding physical structure and strength. Rick Neumann is quick to point out that stained-glass artists must think in terms of hundreds of years, because that is how long stained glass is meant to last. Sound challenging? Yes, it is. And a lot of responsibility, too, considering some seventy percent of their lively-hood is based on commission. That means that when a client requests that twenty-five visual elements be included in the design of a work, it is their job to figure out how to get all that in, succinctly, beautifully, with originality, and with structural integrity. Impressed yet? One particular work recently created by the pair was challenging in all the aforementioned aspects and, happily enough, has been completed as a testament to their adaptability and masterly control of their medium. This piece, on display at their Strand Avenue studio for Gallery Walk on March 2, was commissioned by Peter Lilienthal. It includes landscape elements, three portraits, a number of flags, a quantity of specific personal symbols, and a bit of sacred geometry -- all woven together. The design is circular and four feet in diameter. The way all of the elements have been combined -- in a totally flowing and harmonious composition, balanced, uncrowded and visually captivating -- is instantly impressive. The narrative drawing and portraiture, created using the aforementioned technique of traditional glass painting, mostly by Liza King, is very well done. The three portraits exemplify this as much as anything in the piece. The pictorial design uses three different sizes of "H-channel" lead in its structure. Whatever your orientation, be it art or craft, this very involved piece of work is remarkable to contemplate. Another recent piece, made by Rick Neumann, is a vertical work on display at the studio. 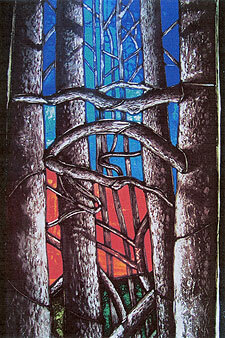 Five feet in height, this piece is very simple and depicts the view through tree trunks in a forest. A texture describing the tree-bark has been created using glass painting on the opaque surfaces of the trunks, which also have branches winding here and there. Between the semi-silhouetted trees, shapes of colored transparent glass describe the sky beyond. These "sky-shapes" shift in color, moving up through the piece in imitation of such a scene in nature. But, something else is also quite amazing about the landscape space defined by this picture-in-glass. After focusing on the trees themselves, their gestures and textured bark, one looks past the trees, at the sky, and thus, through the glass and into the world beyond. In other words, the eye shifts from the illusion of space in the drawing of the trees, to the reality of space in the world. Both are together in this work, and somehow that seems surprising, like finding out that illusion and reality are part of each other. While being nothing so involved as the previously mentioned commission, this work was strong, too. And poetic. To make the journey to this great Brattleboro studio by foot, head up past the Fire Station on Elliot St. to the further end of Green St.; continue along Western Ave. a few tenths of a mile to your second left on Crosby St. At the end of the block, take the left fork onto Strand Ave., which heads downhill. The old Swedish church sits on the left about halfway down the block. To return to Main St., continue downward to Williams St. and follow the Whetstone Brook back downtown, or cut left at the crossroads and hoof it back down Elliot. Visit online at www.neumannstudios.com.